Happy almost Thanksgiving! 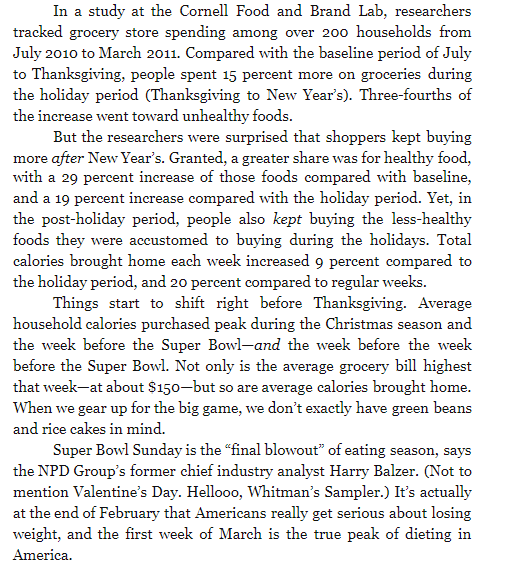 Please enjoy this bit of trivia I recently stumbled on about American food consumption patterns during this time of year! It’s from the book “Devoured: From Chicken Wings to Kale Smoothies – How What We Eat Defines Who We Are” by Sophie Egan. 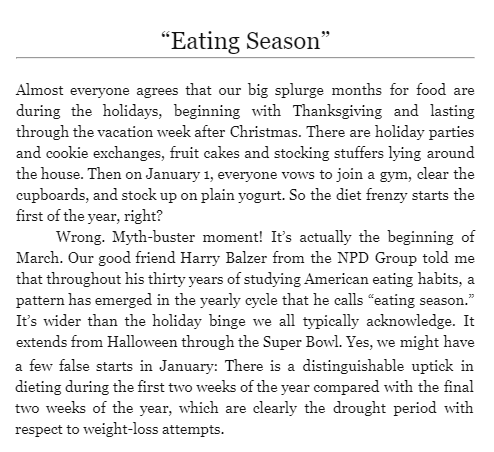 I had no idea that “eating season” had gone so far outside the bounds of what I think of as the holiday season. Kinda makes you wonder if this is all just being driven by winter and the holidays are just an excuse. On a related note, my capstone project is done/accepted with no edits and I will probably be putting up some highlights about my research in to food insecurity and health habits on Sunday. That would definitely be an interesting way of untangling it! Another might be to compare different regions within the US to see if the effect was more or less pronounced in those regions with more pronounced seasons….say southern California vs Minnesota.